Whether you are just beginning to consider purchasing a boat, or have been an avid boater for years, it’s important to familiarize yourself with the benefits of boat insurance. Although boat accidents may not occur as frequently as auto accidents, it’s just as crucial to protect your boat as you do your car in the event of a loss. If you own a boat or plan to purchase one, review the five benefits below to better understand how securing boat insurance can help you ensure that the investment you make in your boat remains protected. 1. Coverage is flexible. With a wide range of liability limits, various deductibles and additional coverages to choose from, boat insurance coverage and rates are quite flexible. While a typical boat insurance policy includes deductibles of $250 for property damage, $500 for theft and $1000 for medical payments according to the Insurance Information Institute (I.I.I. ), these rates can vary and affect your premium accordingly. The I.I.I. also reports that depending on the boat owner’s preference, most companies offer boat insurance with liability limits starting at $15,000 with the option to increase them up to $300,000. Boat owners also have the ability to purchase an umbrella policy to secure additional liability for their boat, as well as home and car. 2. Boat insurance covers property damage. Considering how costly property damage to your boat can be, one of the significant benefits of boat insurance is its ability to provide coverage for this type of damage. In 2010 alone, recreational boating accidents totaled $35.5 million worth of damage to property, the Coast Guard reported. These damages resulted from 4,604 accidents, meaning that each accident racked up approximately $7,602 worth of property damage. On top of this damage, you must also factor in the costs associated with transporting the boat for repair if there isn’t an experienced boat smith in your area. These expenses can add up quickly but fortunately, securing boat insurance will prevent you from having to finance such steep bills alone. 3. A boat insurance policy protects you against injuries to yourself and others resulting from boat accidents. In the 4,604 boat accidents that occurred in 2010, 672 deaths and 3,153 injuries were reported. Another benefit of boat insurance is its ability to provide medical payments coverage to help you finance the costs associated with these watercraft-related injuries. Without a boat insurance policy, if you are hospitalized as a result of an injury on the water and are unable to work while recovering, your family could be left in a financial predicament. 4. 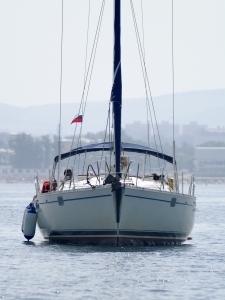 Boat insurance provides liability coverage. Just as you can strike another vehicle on the road, boaters know that accidents can also happen in the water, and if you are deemed at fault for a boat accident that involves another person or watercraft, you will need liability insurance to help cover the damages. Considering that boat accidents can be extremely expensive, this is an important type of coverage and benefit of obtaining boat insurance. Diesel engine credit – you could receive a discount for owning a diesel powered watercraft, which are less hazardous than gasoline powered boats since they are less likely to explode. Multi-policy discount – many insurance companies will offer you a discount if you insure your home and car with the same company with which you decide to insure your boat. At Eaton & Berube Insurance, our trusted NH insurance agents can help you find the best boat insurance policy for your specific watercraft. We will explain the different types of coverage available to you, as well as make recommendations to help you decide which deductibles and liability limits you should carry. To get a free New Hampshire boat insurance quote, please call us at 800-660-5362 or submit our online quote form.